The Corporate & Community Site Index gave up another 12 points after plummeting 36 points last week; it’s now at an all-time low. As can be seen in the chart, the predicted April boost in traffic rankings came and went for this group of sites. That TheDryDown—an aggregator site and portal to all the Smelly Web—has declined in ten of the last twelve weeks is not good news for smelly sites in general. 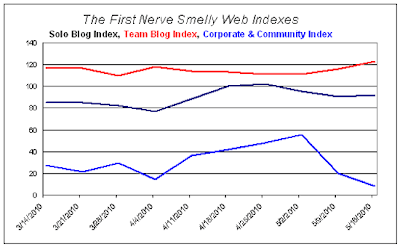 With component sites showing big movement in both directions, the Solo Blog Index netted out a one point gain. GrainDeMusc gained big time for a second week, and IndiePerfumes recovered some of the ground lost in last week’s slide as Lucy Raubertas ended a lull in posting. The Team Blog Index followed last week’s five point gain with another seven positive points. Again, it was PerfumeDaRosaNegra and ISmellThereforeIam leading the way. 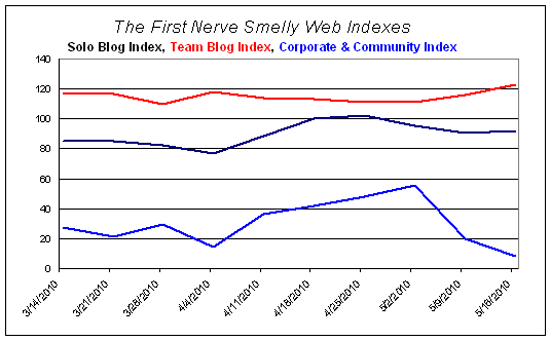 When the Smelly Web Indexes began last August, they were each pegged at 100. Despite all the ups and downs since then, the Solo Blog Index (currently at 92) and the Team Blog Index (currently at 123) have fared well. The underlying Alexa traffic rankings of solo and team sites are the same or better ten months later. The same cannot be said for the Corporate & Community Sites Index. Since last November it has been on a bumpy but steady decline. TheDryDown began with an Alexa ranking of 1.4 million; it is now at 6.3 million. OsMoz was at 170 thousand; it is now at 245 thousand. BaseNotes and Sniffapalooza are at roughly the same altitude they had when the CCSI began. Sorry to hear it. I've been pulled away from blogging by Real Life and the Alexa gnomes are going to slam me very hard very soon. Sigh. I'll post a bunch of Quick Sniffs in a couple of minutes to amuse you as lie in bed.